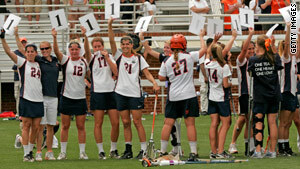 After Sunday's game, Yeardley Love's lacrosse teammates emerge from huddle holding signs with her jersey number. Towson team wore orange armbands stitched with her initials, Y.L. (CNN) -- Love was present everywhere at the University of Virginia's Klockner Stadium on Sunday -- in the stands, over the loudspeaker and on the field. "One Team; One Heart; One Love," read the warm-up T-shirts that members of the school's women's lacrosse team wore. Spectators waved a sign reading "No. 1 Yeardley in our hearts." At the end of the game, as the team celebrated its 14-12 victory over Towson University, the song "Believe" by Cher played over the stadium sound system. Its lyrics: "Do you believe in life after love?" The tribute was in honor of slain teammate Yeardley Love, the 22-year-old senior found dead in her off-campus apartment on May 3. A former boyfriend and member of the school's men's lacrosse team, George Huguely, has been charged with first-degree murder in her death. Sunday's game in the first round of the NCAA championship tournament was the first the team had played since Love's death, and the day was marked with remembrance. The Virginia team wore black patches on the front of their jerseys with one word: Love. The Towson team wore orange armbands stitched with her initials Y.L. Love's mother and sister, Sharon and Lexie Love, were present in the stands to honor the game she loved. "I think we're exhausted, we're drained and I think it's never felt so good to win a game," head coach Julie Myers told ESPNU after defeating Towson. "Not only is it an NCAA game, but just to get this hurdle cleared over -- the kids did a great job." After celebrating the win at midfield, the team surprised those in the stands by emerging from their huddle holding signs emblazoned with the number 1. It was one last tribute to Love, who wore that number for her team.